We have a new resident here joining our Shirt Sleeves family and we are so excited to introduce her to you. Penny Black is coming to Shirt Sleeves to make her debut for the first time this fall – 2018. The collection is full of unique, luxurious, innovative pieces that are sure to get your fashion taste buds tantalizing. We feel sure Penny Black is a brand you’ll adore to wear and love treating yourself to time and time again. PENNYBLACK is designed, created, produced and distributed by Manifatture del Nord, part of Max Mara Fashion Group.Founded in 1978 PENNYBLACK is one of today’s most popular women fashion brands in Italy and is constantly growing and widely spreading in Europe, Central Asia, Far East and South America. PENNYBLACK’s distinguishing traits are good value for money and totally satisfies the needs of today’s outgoing and self confident woman, who is seeking a sophisticated but easy-to-wear style, and is looking for high quality fabrics and accurate finishing. Enough of the suspense… here’s a little teaser with our favourite pieces that are soon to arrive at Shirt Sleeves. We are beyond excited ! Sport luxe is still a very big influencer this Autumn/ Winter and this cricket inspired sweater is no exception to the trend. The burgundy and black trim add a further sporty finish, as well as adding interest, style and colour to the garment. The perfect on trend cosy sweater for those chillier days this Fall. If this piece is not on your Winter wish list, we’re not sure what will be. 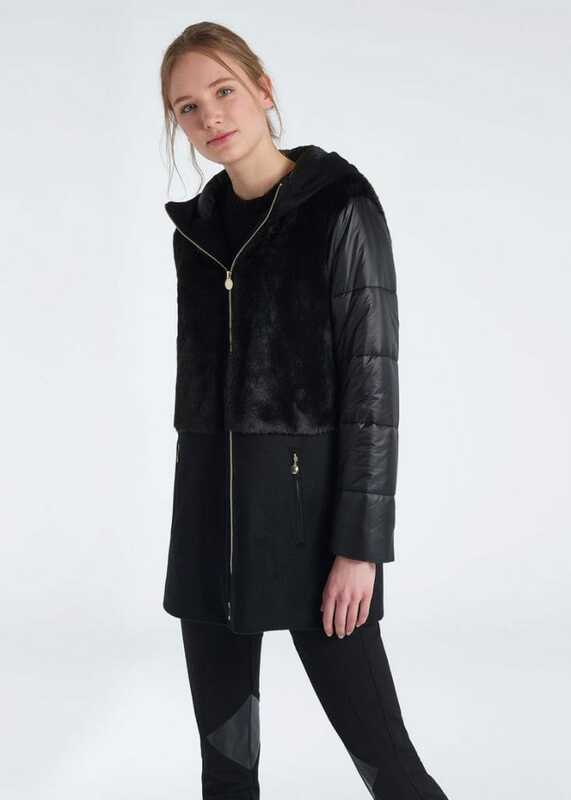 We are absolutely wooing over this jackets uniqueness; the combination of plush, wool velour and technical fabric make it very wearable yet extremely fashion forward. It’s straight fit makes it great for all body shapes. Could this piece be any more desirable ? 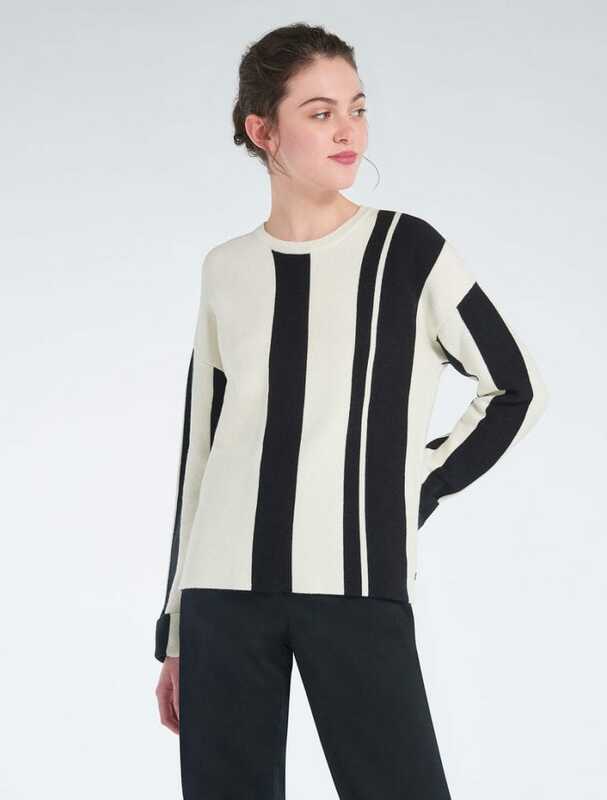 Yet again taking its influence from the latest sports luxe trend we adore this monochrome sweater. The intermittent stripes giving this a football-esque vibe, very in keeping with this years world cup success. Football fan or not this piece is modern, stylish and can be worn casually or smart. Want a new statement coat this Winter. Here’s your answer ! Striking black and white stripes, the perfect combination to match any outfit, any colour! This timeless piece will keep you going for many seasons to come. We love the matching sweater underneath giving an off-beat modern edge. Tie front sweaters have been making their debut for a few seasons now and there is no stopping them yet. A modern twist on a classic sweater, the tie front gives us something different, revitalizing the tired plain polo shape we all hate to love during the Winter months. Cream the perfect versatile colour teamed with any jacket or trouser. Last but by no means least in our list of favourites is this fun pom pom detailed sweater. We love a quirky detail that helps you stand out from the crowd and this is just that. Perfect both day or evening, add a little fun to your wardrobe with this sweater this season !